alaTest heeft 126 reviews verzameld en geanalyseerd voor Sony HDR-CX440. De gemiddelde beoordeling voor dit product is 4.3/5, vergeleken met een gemiddelde beoordeling van 4.0/5 voor andere Camcorders. Reviewers waarderen het geheugen zeer maar hebben twijfels over de zoeker. Het gebruiksgemak is ook indrukwekkend. We hebben de consumenten- en expertbeoordelingen, de leeftijd van het product en andere factoren geanalyseerd. 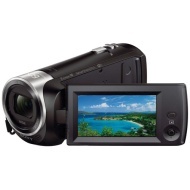 Vergeleken met andere Camcorders krijgt de Sony HDR-CX440 een alaScore™ van 87/100 = Zeer goed. This is a very easy camera to use and work with. I like how fast you can transfer the videos to your computer or table. Awesome product. This is my first full HD camcorder and I have found it easy to use and easy to set up. I'm also very pleased with the picture quality and size of the camera. Also the software provided by Sony is easy to use. No regrets with the purchase of this camera. Zooms quickly, focus response is good, light weight, great photos & videos. This amateur photographer can use it and obtain great photos. Small, Lightwieght, with plenty of memory. Have a camera enthusiast in the family who needs their first camera, but don't want to spend a lot? This could be it. Small enough to fit in a pocket or purse, yet sophisticated enough to empress most audiences with its creations. It takes a while to get the "learning curve" situated in using this camcorder. It has so many features that it's perplexing to a point where you need to practice with it like a musical instrument's until the technique is embedded in one's mind. I recently became a private investigator and on the advice of others chose this camera. It is a great camera and takes awesome video. The zoom is great as well. I really haven't found anything yet that would be considered a con.